“He is the best finisher in the world”, how often have we heard this statement being made about MS Dhoni. Quite a number of times I would say. He has just gone past the aussie great Adam Gilchrist and is only behind the Lankan legend Kumar Sangakkara on the list of wicketkeepers who have scored the most number of runs in one-day internationals. While the other two were top-order batsmen, Dhoni has achieved this feat batting in the lower half of the batting order for most of his career. When it comes to the best finishers, Michael Bevan ruled the castle for a number of years. He had the ability to bat with the tail, find gaps at will, turn singles into doubles and look for an odd boundary once in a while. What has made Dhoni more reliable and more successful than Bevan is his ability to soak up pressure and his confidence in his abilities. He could let the required run rate climb high while he settles himself on the crease and then within a span of a couple of overs he could bring it down like anything. The fact that he could deposit the best of the bowlers and their best of the deliveries into the stands, one after the other made him near invincible in tough chases. Not to forget his running. His high level of fitness has made him able to run fast between the wickets and still hold his shape when he tries to hit them big. Things have changed in the recent past. MS’s dot ball percentages have gone up. Bowlers have found a way to keep the ball away from him and minimize the damage. Often he has allowed the required rate creep too high to put himself in pressure of hitting every ball at the final stages of the game. He has not been able to convert his slow starts into an explosive finish. Age doesn’t help the cause either . Dhoni is 36 now. He has kept wickets for India for almost a decade now. He has had back problems. To add to that, he doesn’t play test cricket anymore, which obviously has affected his consistency pertaining to the fact that he is not playing all the time. Starting slowly is no longer a viable option for him. Perhaps it’s time to rethink the method MS has been using for years. It is time to pace his innings in a different way. He might as well start a little more aggressively. He could change gears and step on the accelerator a little earlier so that the pressure doesn’t climb up on him or the team as a whole. 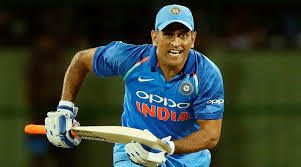 Leaving it till the concluding stages of the game was a dauntless strategy that only a man of Dhoni’s stature could pull off, but since that’s not succeeding very often it will be better if he adapts and find new ways which could help him bring back the charm he has had as a finisher. Dhoni has been by far the greatest finisher the game has ever seen. He has been one of the most successful Indian Skippers. He has been the only captain to lift all the three major ICC Trophies viz. ODI World Cup, T20 World Cup and the Champions Trophy. We don’t want him to go down like this. We want him to be as good as he was before. We want him to finish nearly as strong as he started. ⟵Why Oscar is still a dream for Bollywood?